"Salaries for political appointments - ministers, ministers of state and parliamentary secretaries - are estimated to be $58.28 million, or 8.8 per cent higher than last year. If I didn't read this article all the way through, I would have missed this important piece of news. "Ministers, ministers of state and parliamentary secretaries got 8.8% more pay! Hooray!" If not, how will Singaporeans know that their very talented political appointment holders were given yet another well-deserved pay raise, right? As I caught up on my daily fare of important news of the day, I spotted this headline from Malaysian news: "Malaysian parlour offering naked orgies in guise of foot massages"
According to the news report, police raided foot massage centers in Malaysia and found many foot masseuses from China and Indonesia without a stitch on, and with naked male clients. What a shocker. Massage centres that were actually prostitution dens. Who would've guessed? The article went on to say that not only were these foreign masseuses massaging the feet of their male customers, they were also offering massage on the "most sensitive part of the body." On the morning of Chinese New Year, I woke up to the kids playing Chinese Aeroplane Chess (飞行棋) in the living room. I smiled at the sight of the two of them rolling the dice and moving their round aeroplane tile around the map because it reminded me of a time when I played it as a child. Then Joy suddenly declared she didn't want to play anymore, and stomped away in a huff, to sulk under a table. "I don't want to play anymore," she said in exasperation, "I keep losing and I want to win." Isaac tried to convince her to come back to the game while playing for the two of them. He rolled the dice and moved her counter, then rolled the dice and moved his own. "Look Joy Joy! We are both winning! Come back and play with me lah!" Joy was still too mad to take up his cheerful offer. And collapsed dramatically on the sofa. I laughed out loud, wondering how I was going to teach the two of them about learning to accept losing and winning graciously. Before I even thought that through, the kids were already playing something else, forgetting about the game and about winning and losing. If only we knew how to get over things that quickly as adults. Elite police force trains to fight the onslaught of casino crime at mrbrownshow.com! This page from TODAY newspaper (pg 23, Friday 18th Feb 2010) has a story about a man flinging infant off a bridge and next to that, an ad for Milo showing a kid on a diving platform. A most unfortunate placement of news and ad, methinks. Here are some photos of my little night out with my mom on Chinese New Year's Eve. It was quite an experience driving her to her temple visits. I feel a little sorry for tourists who visit Singapore during the Chinese New Year period. Most eateries are closed from Chinese New Year's Eve due to the reunion dinner, all the way to at least the second day of New Year. This year it was worse, because the first day was a Sunday, so everything came to a standstill from Saturday and only restarted on Wednesday, the fourth day of New Year. I was at Sim Lim Square on Saturday, New Year's Eve. While the womenfolk in our household prepared for the reunion dinner, the menfolk, that is, me, went out to do some last minute shopping. My official reason was to pick up an iPhone headphone for the wife and also some tools and parts to repair a broken bed. The streets were empty and many shops had their shutters down. This was Saturday afternoon, so it looked like a surreal scene out of a zombie movie. In Sim Lim Square, technology mall and the tourist rip-off city of Singapore, most shops were closed or closing. I could see tourists looking a little dazed. They must be wondering why no shops were open on a Saturday to take advantage of them. Joy had an clothing tantrum this morning, when she was asked to wear her kindergarten uniform to go to school. She wanted to wear her Chinese New Year costume, because she saw Faith and Isaac wearing theirs to school, but her kindergarten told us today was still a regular uniform day for her. "Why can't I wear my Chinese New Year princess clothes?" she wailed. "Jie Jie and Gor Gor wore theirs to school! Why can't I wear mine? I am a Chinese too, you know!" You can't argue with cute logic like that. But we had to convince her to wear her regular uniform instead. If only she feels as strongly about her Chinese roots when she does her homework. That same morning, I had to take a frustrated little girl through her Chinese homework. Anyone looking into our living room at the time would have wondered what kind of drama was going on, from the woeful tears flowing from Joy's four-year-old face, when all I was asking her to do was to write her Chinese name. To be fair, it was my fault for giving her a really difficult-to-write Chinese name but what to do, she's got to learn how to write it. A supermarket loses trolleys: Why is this even freakin' news? Only in Singapore does the national paper carry a front page above-the-fold colour photo lead-in to a news report about a supermarket losing its trolleys. It seems that NTUC supermarket's loss of trolleys is now a national crisis. Their trolleys must be very special, maybe made of gold or something, because I don't see any other supermarket's lost trolleys given this kind of media coverage. Even CNA has a report on this. "Every month, hundreds of NTUC supermarket trolleys are lost to thieves and lazy people. This needs to stop. Trolleys are innocent helpers of mankind. Trolley are beasts of burden, carrying your groceries to your car, never complaining, never asking for a word of thanks. Don't abandon our trolleys. They have a home too. This public service announcement is brought to you by NTUC Supermarkets." NTUC, go and deal with your own trolley problem and stop wasting our time. CNNGo column: Singapore Airshow 2010 — what's the big hoohah? Latest CNNGo.com "Say What? with mrbrown" column: Singapore Airshow 2010 — what's the big hoohah? There is a piece of land with exhibition halls in Changi that mainly sees action twice a year. It is so rarely used that our taxi driver had to ask us for a postal code to enter into his GPS unit. Changi Exhibition Centre is home to the Singapore Airshow, which my buddy and I were heading to. We went on a Trade day, to avoid the mad weekend crowds on the Public days. The last time I went to see this airshow, it was known as Asian Aerospace. But the Asian Aerospace organizers had a disagreement with the Singapore Government so Asian Aerospace ended up in Hong Kong, and Singapore created a new airshow. I actually went to two Asian Aerospace shows, the earliest ones with my wife (then girlfriend). So I have fond memories of the shows. I do not know how I managed to convince her to come along for a show that showcases aircraft and military hardware, things that usually appeal to blokes. And to come along TWICE. Don't anyhowly say things, wait lim kopi! Gongxi you if you kena! Lim kopi at mrbrownshow.com! 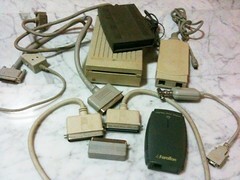 SupraExpress 288 modem, Farallon iPrint Adaptor, Apple Geoport modem from a Mac Quadra 610, PhoneNet for Apple Local Talk networks, an old Apple 1.44 Superdrive, SCSI cables and SCSI terminators (cost a bomb in those old Apple days) and 10base2 BNC Ethernet adaptors (for networking our Mac IIcx, fx and other old school Macs together). I am so reluctant to throw this stuff out, man. Update: A reader just reminded me what they were called... Neoprints. And these were first generation Neoprints too. I feel so old. LOL. Found this photo sticker of the wife and I while spring cleaning. Gosh, I don't even know when this was taken. Must be years and years ago. 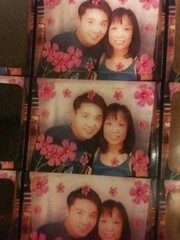 It was the only photo sticker we ever took (we were not really into this kind of thing as a couple). The stickers did end up on our ATM cards for a spell. These are the last three. Ah memories. Latest CNNGo.com "Say What? with mrbrown" column: Singapore, transform! I sometimes wish I lived in Malaysia. Politicians there seem to make more interesting declarations. Take former Malaysian Prime Minister, Tun Dr Mahathir Mohamad. His most recent announcement was that 9/11, the September 11, 2001 attack on the New York World Trade Center, was staged by the US of A. "If they can make Avatar, they can make anything," said the outspoken former PM. In fact, in a later reiteration of his 9/11 beliefs, he went on to say that the Arabs were "not clever enough" to stage such a coordinated attack involving four planes. Wow. That man has testicles. In one fell swoop, he managed to a) accuse the Americans of killing their own people to make Muslims look bad, and b) pronounce the Arabs too stupid to plan such a difficult attack. In contrast, Singaporean politicians tend to say pretty boring things. For instance, we had a recent announcement by a high level Economic Strategies Committee on new economic directions for Singapore. After TOC broke the story of homeless people at Sembawang Park, and after MCYS and Minister for Community Development, Youth and Sports (MCYS), Dr Vivian Balakrishnan, reportedly visited the grounds, Nparks stepped up their enforcement of campers at the beach. Judging from the way the homeless and the campers were treated, I think Singaporeans will be warmed to know we have such efficient public servants who are determined to keep our beaches clean of such homeless Singaporeans. Gahmen has a lot of heart, very take care their people one. As one commenter said, in Singapore, "if you must die from poverty, die quietly." "You say maybe foreigners are paying these high valuations. I think if you check, you’ll find that the majority are Singaporeans. The foreigners who come here and look at HDB flats generally buy the lower value flats. You’ll see that they are spread out in the suburban areas, and their salaries tend not to be that high. They don’t get the kind of grants we give Singaporeans. And it’s not so easy for them. I haven’t done an analysis of the statistics, but I’d be prepared to say that it is primarily Singaporeans who are paying these prices." "We’ve grown in the last five years by just importing labour. Now, the people feel uncomfortable, there are too many foreigners. "Trains are overcrowded with foreigners, buses too, property prices have gone up because foreigners with permanent residence are buying into the market." Me, I blame aliens from Mars.